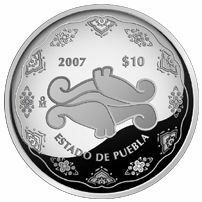 The coin represents a Talavera porcelain plate from the second half of the 18th century with Hispanic-Moorish designs. The words “ESTADO DE PUEBLA” (PUEBLA STATE) appear in the lower field. It comes in a special cardboard box containing a certificate with information about the state: the origin of its name, when it was founded, its coat of arms, geographical location, and general tourist information.